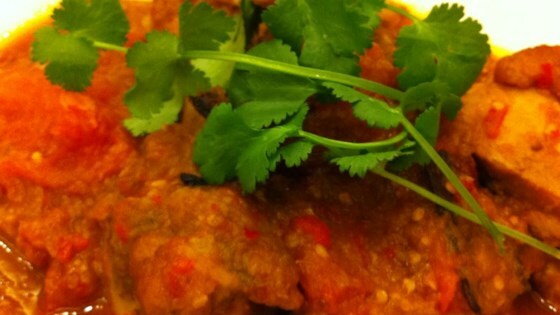 "This is a Malay/Indonesian dish which is spicy and sweet at the same time. Recipe was passed down to me by my mother-in-law, and although it doesn't quite taste the same as the way she makes it, my husband loves it!" Rub the chicken with turmeric powder and salt. Set aside. Soak the dried red chile peppers in hot water until softened. Blend the softened dried chile, fresh red chile pepper, garlic, onion, and ginger in a blender to a paste. Heat the oil in a large skillet over medium-high heat. Brown the chicken in the hot oil until golden on all sides. Remove the chicken from the skillet and set aside. Remove excess oil from the skillet, leaving about 1 tablespoon. Cook and stir the chile paste with the cinnamon, star anise, cloves and cardamom seeds until fragrant. Return the chicken to the skillet. Stir in the water, adding more if needed. Toss in the tomatoes and stir in the ketchup and sugar. Bring to a boil then reduce heat to medium-low and simmer until no the chicken longer pink at the bone and the juices run clear, about 15 minutes. Serve hot. Deliciously spicy hot! Definately pair with some rice (i chose jasmine) to cut the heat. A definate crowd pleaser for those who like spicy ethnic cuisine! I used half a chicken and about 12 dried chillies. Followed the recipe and it turned out well. Definitely a keeper. I cut the chili peppers in half and we really enjoyed it. unless you like it extremely spicy, reduce the dried chili. This dish is spicy hot but nice! Those who cannot take very spicy food, you may want to reduce the chillies. Fantastic!! Ever since I have learnt how to make this chicken I have been preparing it more often. This chicken is very delicious!! Great Recipe! !